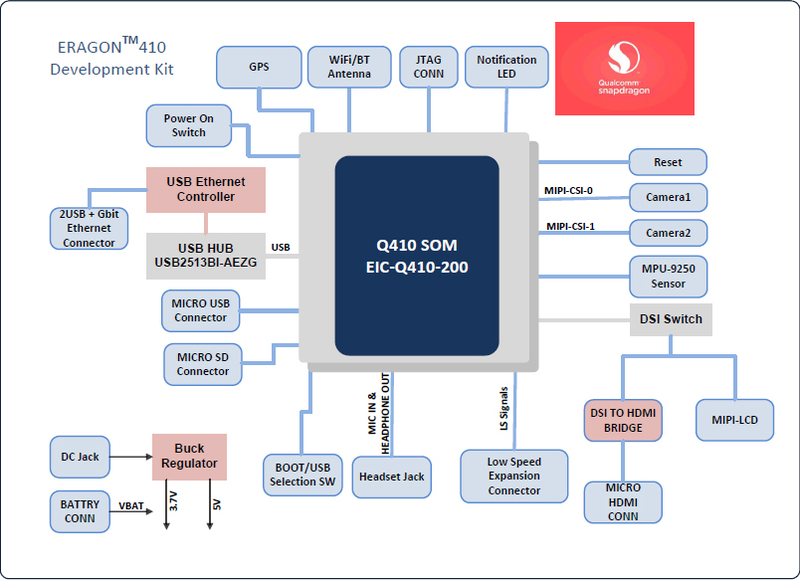 EInfochips’ EIC-Q410-210 is a Development Kit consisting of EIC-Q410-200 Nano SoM and a state of the art connector-less carrier board that interfaces the SoM via edge castellation for an added cost and size benefit. We also offer add on modules forLCD, Camera and Audio that can be purchased as per your requirement. Its modular design combined with feature rich technology, empowers engineers and developers looking for creating next generation embedded and IoT devices with performance, features and power efficiency. The Kit support Android 5.1 (Lollipop), Linux (Linaro 15.09) and Windows10 (In Development) support package. Due to high demand, please expect 4 - 6 weeks of lead time once the order has been placed. 1. What are the accessories available? 2. Does the board support a cellular or GSM connection? 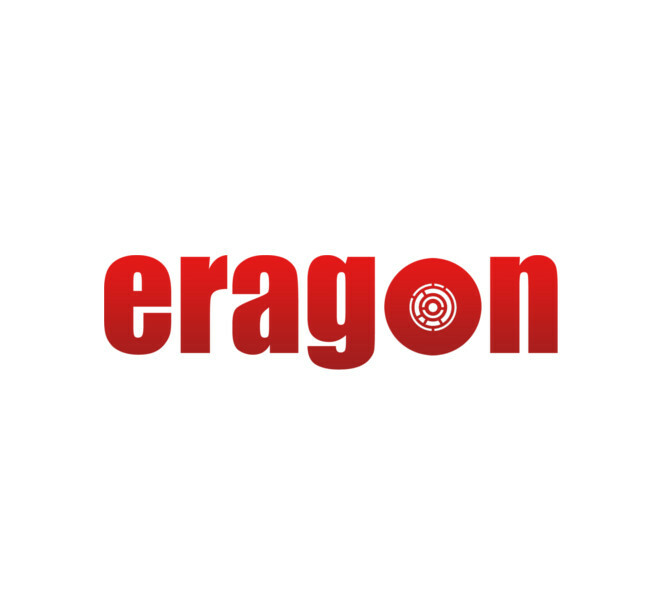 The Eragon 410 does not include support for a wireless modem. Third party cellular modem dongles can be connected to this platform via USB ports and may require special drivers from the respective manufacturers. 3. What are the capabilities of the video Decoder/Encoder? 4. How to use ADB along with some USB device? ADB over Wi-Fi may be used if USB device and adb both are expected to work simultaneously. 5. How to switch display form LCD to HDMI and vice-versa? Eragon410 Supports dual display, it Supports LCD/HDMI switching via "oem select-display-panel". Since micro USB device mode prevents host mode operation, adb (device mode) takes priority and work by default even if you have a USB mouse/keyboard connected. For a USB mouse/keyboard/Ethernet to work, the micro USB to PC needs to be disconnected. For a USB mouse/keyboard/Ethernet to work, the micro USB to PC needs to be disconnected. In order to provide Ethernet support, Eragon410 uses USB to Ethernet Converter. USB device mode takes priority over Host mode, even if you have a USB mouse/keyboard/Ethernet connected. 9. How to switch into Fastboot mode? System may have gone to sleep mode. In order to turn on the screen please press switch SW3. This issue may occur if the HDMI module is not connected with the board. So make sure you have HDMI module connected to the board. on HDMI screen, but I am able to get access through (adb) USB. So how can I get output on HDMI screen? By Default Display is routed to LCD, you need to switch display from LCD to HDMI. 14. I have purchased Eragon410 board without LCD/HDMI board, How can I verify my board is working or not? USB/UART debugging is available to access Eragon410 control. 16. How can I change boot animation in Android? In order to change bootanimation, you have to replace bootanimation.zip in /system/media/ with your intended bootanimation.zip and reboot the board. 17. ADB device not detected. Make sure you have connected the USB cable properly, or may be device is in fastboot mode. If you are using Windows please update adb driver. Refer “ Environment Setup Guide” section 5.2.2. Please share debug logs with eInfochips support team. If problem still persists, please contact to eInfochips support team.